Brewing Company: Epic Brewing Co. Details: Hershey’s dark chocolate bar. Fermentation without Representation is brewed by Epic Brewing Company in Salt Lake City, Utah. The brewery describes Fermentation without Representation as “an imperial pumpkin porter to celebrate the season”. This was my first experience with Fermentation without Representation and I immediately felt it was a delicious beer. The taste had some pumpkin spice / nutmeg flavor to it but it was not an overwhelming amount. It was a very smooth, tasty porter and was not overpowered by the spices. 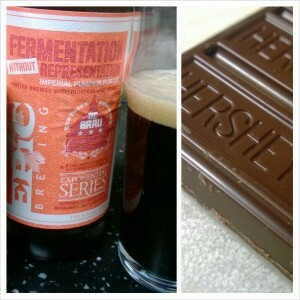 We decided to keep the pairing simple and sweet so we had some dark chocolate. Nothing terribly fancy, just a Hershey’s dark chocolate bar, but good nonetheless. The big question is: how was the beer with the food? The answer is: good. The pairing slightly improved the beer. It rounded out the edges a little more without detracting from the spices. Overall, this was a very nice pairing and one that would be tasty the entire holiday season.